One of the big themes of Apple's software releases this fall is the opening up of Siri. 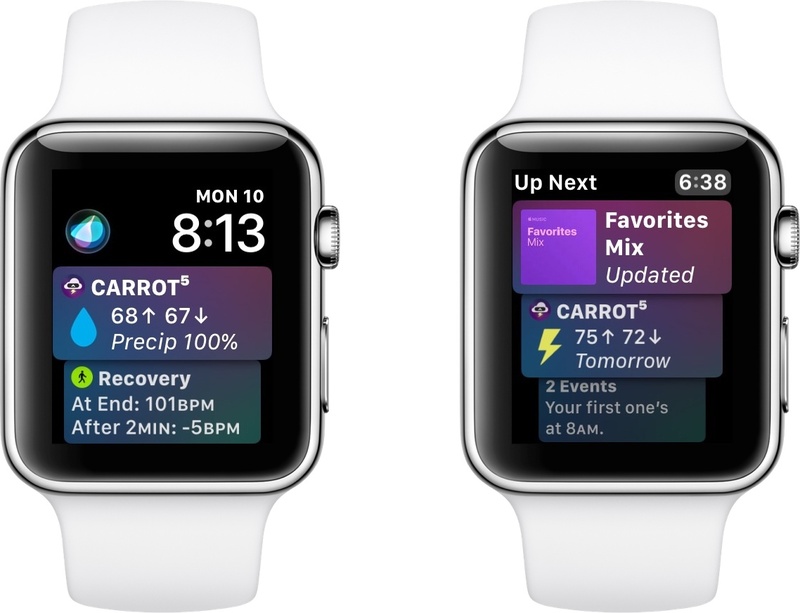 With day one adoption of both Siri shortcuts and Siri face integration on the Apple Watch, CARROT Weather makes for a wonderful demonstration of how valuable this new, extended Siri can be in all its various forms. Finally, Siri can provide weather data from sources besides the first-party app, both through the standard voice interface and, to my delight, on the Siri watch face. And CARROT Weather takes great advantage of both new capabilities. Often when an app receives immediate support for a significant new OS feature, its implementation of that feature isn't as rich or extensive as updates that arrive later. With iPad drag and drop in last year's iOS 11, for example, the note-taking app Bear had early support but in a limited fashion; innovative drag and drop features like the Drop Bar didn't arrive until later. With CARROT Weather's shortcuts support, however, I can't imagine anything better than this release. There are a whopping 17 different kinds of shortcuts you can set up in CARROT Weather. The main ones are Current Weather, Extended Forecast, Rain Report, and Interact, but an additional 13 exist for other data points like Sunrise and Sunset, Wind Speed, Moon Phase, and more. 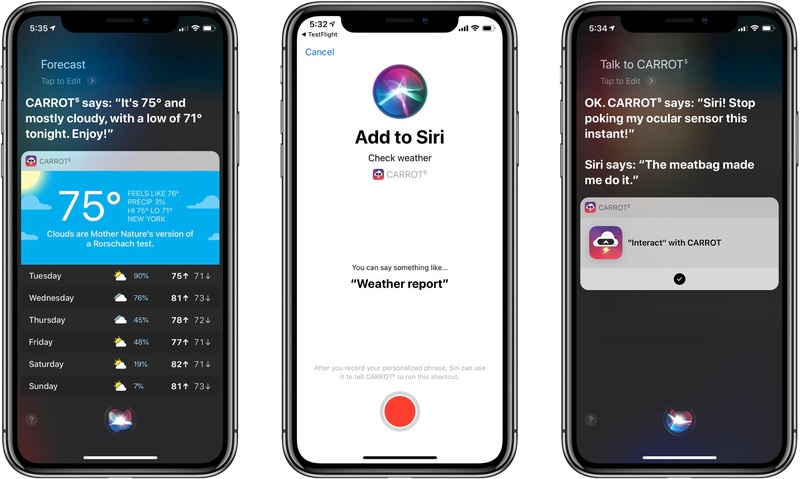 Most are self-explanatory, but the Interact shortcut is a fun addition from developer Brian Mueller – its simple purpose is to provide an avenue for Siri and CARROT to interact with each other, with you playing the amused spectator. Shortcuts invoked via Siri provide both informative verbal responses, as well as rich visual summaries in the Siri interface. I've found that Siri's verbal responses provide the base level of information I'm looking for, while the visual summaries are perfect for when I want a little more data at a glance. Since this is CARROT Weather we're talking about, one of the most customizable apps I know of, it's only fitting that you can modify both verbal responses and visual summary cards to your exact specifications. The Current Weather and Extended Forecast shortcuts provide options to pre-set a specific location (the default is your current location), and you can change the temperature from Actual to Feels Like, modify the data shown in four slots on the visual interface, change settings for both displayed and spoken summaries, and finally, you can modify data types on the daily rows. As you make changes, a live preview at the top of the screen will update, helping you understand exactly what your final setup will look like when invoking shortcuts. I've tested a lot of apps with shortcuts support, and CARROT Weather is one of the most impressive I've used. With shortcuts available for anything you could think of in the app, plus rich visual Siri responses, and extensive customization options, anything I could want is already here. Shortcuts would have been reason enough to get excited about this release, but today's update to CARROT Weather also includes a feature I've wanted for over a year now: integration with the Siri face on Apple Watch. I've used the Watch's Siri face non-stop since first installing a beta of watchOS 4 last summer. It's been a fantastic tool for me despite being limited to first-party apps at first. But with watchOS 5 opening the face to third-party integrations, I can finally get updates from my favorite weather app right on my favorite watch face. 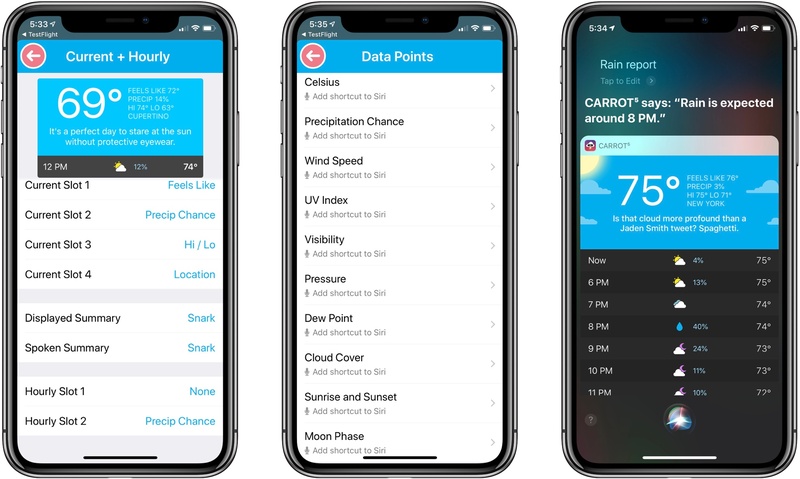 CARROT's integration with the Siri face comes in two flavors: by default, the app will show you a card in the morning with the day's forecast, one in the evening with tomorrow's forecast, and cards with relevant precipitation updates. If you'd like more regular updates throughout the day though, the app recommends putting CARROT in your Watch's dock and turning on a 'Show More Cards' option from the iPhone app's Siri face settings. With that option enabled, the app is able to update its card every hour with the latest weather conditions. I immediately turned on 'Show More Cards', and have enjoyed getting regular updates from CARROT throughout the day on my wrist. CARROT Weather has been on a tear with frequent quality updates since its big 4.0 launch in July 2017. It should come as no surprise, then, that the app brought quick support of Siri shortcuts and the Siri watch face. What is surprising is how complete and well thought out these feature implementations are for day one releases. CARROT was already a fantastic app, but pairing it with Siri has taken it to a new level.